Designed in 1972, the 1081 was originally conceived as a combined mic/line preamp and equalizer section for the Neve modular consoles. The 1081 provides remarkable sensitivity, fast and musical response to transients, plus inimitable Neve equalization featuring effective high - and low-pass filters designed to seperate unwanted signal outside the passband. The Neve 1081 is a highly sought after mic preamp – and not just for the nostalgia. Take a look at the credits on any of the day’s platinum-selling albums, you’ll notice these vintage consoles are still commonly deployed to incredible effect. 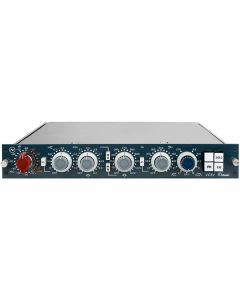 The Neve 1081’s status as a truly indispensable component in a recording front-end or mixing environment is undisputed. 1081 modules are still built bespoke, by hand in Burnley UK, in a virtually identical manner to the original models right down to the parts and components. Hand-wound transformers come as standard and are combined in a manufacturing process that has been honed over decades. Extraordinary sensitivity, high-speed and musical response to transients, plus matchless Neve equalization containing effective high- and low-pass filters designed to separate unwanted signal outside the passband are all delivered by the Neve 1081 mic preamp and equaliser. Curves and slopes have been carefully tailored to enable users to exercise optimal technical and creative skill. Users are also given an adaptable device with which to develop new sounds and manipulate any part of the audio spectrum. The Neve 1081 has been found to be an indispensable tool for recording and mixing drums, bass and percussion by more than three decades of engineers. As comes standard with all Neve outboard equipment, users are guaranteed the utmost quality signal acquisition, thanks to uncompromising Class AB circuitry, hand-wound Neve-designed transformers, and unparalleled care to every last component and construction factor. Freq response: ±0.5dB 20Hz to 20kHz, -3dB at 45kHz. EQ Out. Freq Response: +/-0.5dB 20Hz to 20kHz, -3dB at 45kHz. EQ Out.